The Sun (XIX) represents hope, energy and unbridled optimism. As such, the nineteenth Major Arcana is often associated with the accomplishment of important tasks. 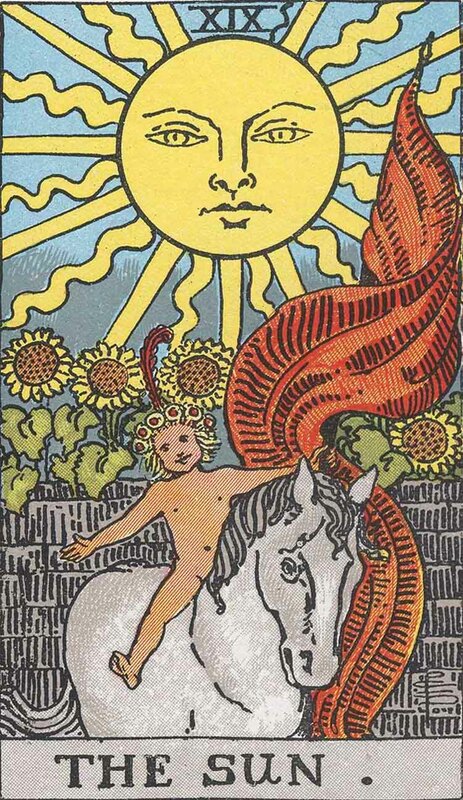 In the English Rider-Waite deck, a child spreads her arms atop a white steed, under the steady, calm gaze of an anthropomorphic sun. An orange banner flows from the ground, rising towards the sky. Four sunflowers can be seen in the background. The child, naked except for a wreath of yellow flowers, represents innocence and joy. With her earnest smile and open arms, she exudes confidence as she straddles the powerful beast. The white horse’s head is bowed, symbolizing harmony and connection with the natural world, while the orange banner flanking the horse represents vitality, movement and action. The Sun tarot card represents people who are optimistic and full of energy. They radiate positivity on all those lucky enough to be near them, causing their entourage to feel uplifted and reinvigorated. They are best suited to careers in which they are able to spread their positive influence, leading and inspiring those around them to fulfill their life goals. Along with this exemplary confidence comes clarity and direction. However, the Sun can sometimes shine a little too bright and become blinded to the reality of certain situations. Nonetheless, the Sun’s rationality typically allows him or her to make the right decisions and choose the path that leads to success. The Sun card upright is an invigorating sign: charge headfirst and invest yourself fully in your endeavors, as the Sun’s positive influence will bring exciting new opportunities. With confidence like the Sun’s, you love both yourself and those who surround you. You may not be perfect, but your ability for self-reflection and positive change will attract interesting new people into your life, affording you the opportunity to explore new romantic relationships. Don’t forget to also spend time with those who have always been there for you, and to remind them of how important they are. Your love is a positive force in their life, and they would enjoy nothing more than the opportunity to be with you more often. If you are already in a relationship, the Sun suggests a bright future for it. Your confidence extends to your partner, whom you will continue to appreciate and trust. If you are having relationship problems, the Sun encourages openness and clear communication. The Sun also indicates that an important, positive event will take place in the future. Finding your soulmate, getting married, or even having a baby — anything is possible. From a professional standpoint, the Sun is an excellent sign. Your participation will be crucial to the success of certain projects, while your efforts and optimistic outlook will be noticed by those surrounding you. This hard work and your sunny disposition will pay off, allowing you to attain new heights in your work space. This might mean better working relations with your coworkers and your boss. It might also mean that you will be getting a promotion. This success is entirely yours, so don’t forget to take the time to enjoy the fruits of your labor, and to congratulate yourself on your achievements. As your career is going well, your financial situation is looking equally positive. You may see the opportunity to make a bit of money on the side, or pay off any debt you may have. This is also a great time to splurge on something you’ve been wanting for a long time, as a reward for your hard work. Your outlook on life and psychological well-being have a positive impact on your physical health. This is the perfect time to try out a new hobby or sport. The Sun card reversed means that those powerful feelings of confidence and optimism are being blocked or overshadowed by a negative presence in your life. You may be feeling uninspired and unmotivated, but rest reassured that this state is only transitory. The reverse Sun may also indicate that you are acting overly confident. You may be forging ahead into something you can’t handle alone, so take a step back and evaluate your endeavors, both professional and personal. If you’re single, you may be coming across as overconfident or egotistical when meeting potential new partners. Confidence is attractive, but remember — everyone loves a good listener. If you’re already in a relationship, make sure you’re not taking up too much space, because your partner may feel outshone or unimportant to you. The reversed Sun may indicate that you’ve been experiencing difficulties at work. Perhaps your coworkers or your boss haven’t been responding well to your suggestions, and you don’t feel as though your participation in projects has made a significant difference. The reverse Sun may also mean that you’ve given yourself impossible goals, thus setting yourself up for failure. Try to take a step back and determine what has been preventing you from thriving in your workplace. Perhaps you need a break, some time to recover your confidence. This is probably not the best time to spend significant amounts of money or make important financial decisions. If you absolutely must, take as much time as you can to go over the numbers. Perhaps you should ask for advice from someone with a different approach or opinion on the matter. The reverse Sun may also indicate that your outlook is exceedingly pessimistic. Your situation may not be as dire as it appears. Proceed with caution, but make sure you’ve done the math before going into emergency mode. While the upright Sun imparts optimism, the reverse Sun may indicate that you are feeling under the weather and unmotivated. You may have stopped practicing a hobby that you enjoyed in the past. Take time to evaluate the reasons why you have given up on it. If you are worried or feeling pessimistic about your physical or psychological health, don’t be afraid to go see a doctor. The Sun is a welcome card in any position. In the past position, it indicates that you likely had a sunny, positive upbringing. Look back on your childhood and show appreciation for the people you no longer spend time with. You may feel the desire to contact those you miss, or those who helped make your childhood so memorable. The Sun in the present position means that you’re the center of attention, either at work or within your social entourage. All eyes are on you, so try to keep your feet on the ground — enjoy the attention, but remain modest and kind. The Sun in the future position suggests that your current efforts will likely be fruitful, so don’t give up on them. You may notice certain situations turning out even better than you originally expected. The Sun is a very constructive card. When combined in a reading, it positively influences and amplifies its counterpart, effectively adding its optimistic vitality to the combination. Symbolizing control, perseverance and victory, the Chariot combines well with the Sun, suggesting a powerful, positive outcome in the near future. An aspect of your life will be elevated. Perhaps you will experience a huge promotion, or an important deal will pay off. This is a good combination for taking a risk that you otherwise would not. It suggests that you explore your more daring side, as it may greatly pay off. The Hermit represents wisdom through solitude and enlightenment. In this respect, the Hermit is similar to the Sun, which represents clarity and insight. 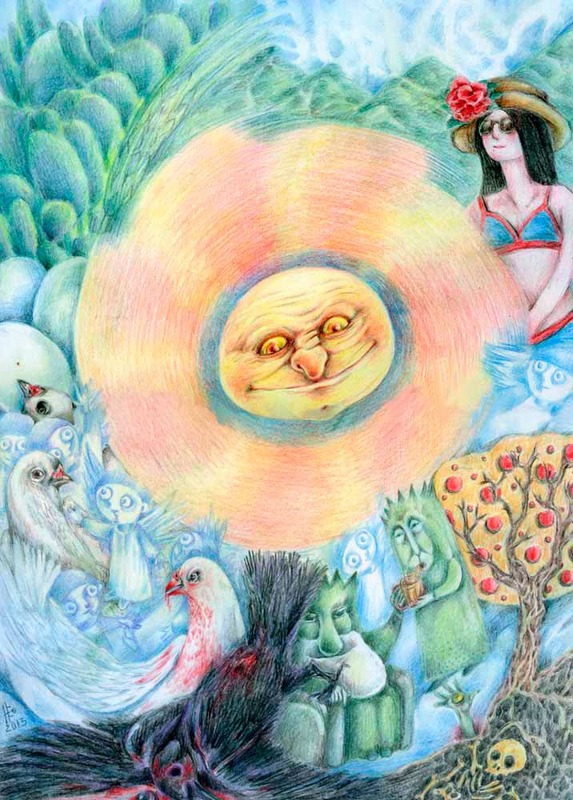 The Sun and the Hermit combine to illuminate both your outer situations and your inner self. The combined symbolism of the old man in the Hermit and the child in the Sun represents rebirth and renewal, meaning that this is perhaps a great time to reinvent certain parts of yourself. The combination of the Sun and the Lovers indicates a rekindling of relationships. You will undoubtedly welcome the opportunity to spend quality time with your partner, as you enjoy renewed interest in each other. If you are single, the Sun and the Lovers suggest that a new relationship may soon blossom. Since the Lovers represents the union of opposing forces, be open to the possibility of meeting someone who is very different from yourself. The Moon symbolizes qualities opposite to those of the Sun, such as anxiety, mystery, and insecurity. When combined with the Sun, this reading suggests the presence of duality in your life. While the Sun represents the conscious, the Moon symbolizes the subconscious. You may therefore experience a heightened awareness of your inner and outer self. The positive nature of the Sun provides a resounding “yes” to all questions.